A Straight-forward Guide to 2013 Car Shopping: How We Found a Great Car! So I know I haven’t written a post in a while, but we recently bought a new car and I was asked to help guide a friend in his search. 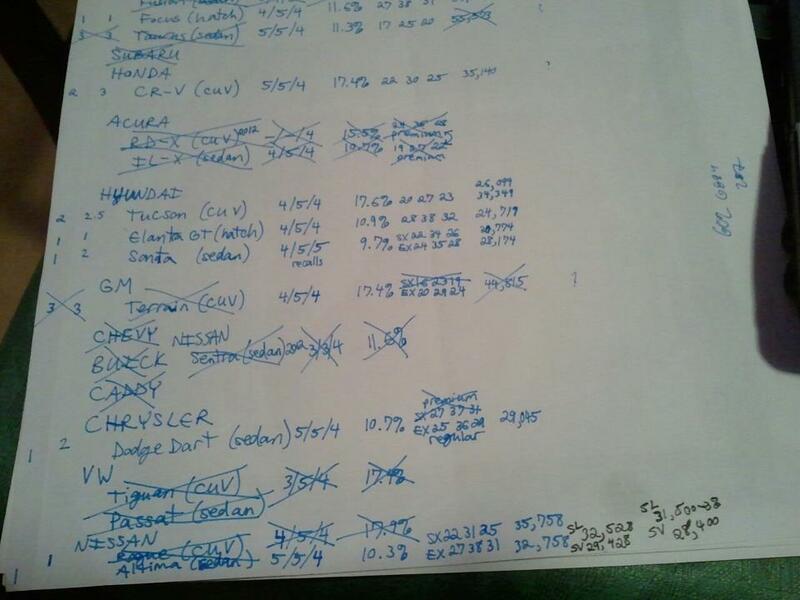 I thought maybe some of this could help others looking for 2013 car models as well! Plus I did a lot of typing just now, so I want to use it to help more people!! I’m kind of a strong (read: obsessively) organizational person, so here is how we ended up deciding to buy our brand new 2013 Nissan Altima. My bf’s Mazda Protege 5 lasted him since 2002 with good maintenance, so understand we probably did a lot more homework with the hopes of keeping this car as long (or nearly as long) as the last one. We may not have been correct with all our data mining but I’d like to think we were pretty close, and the opinions stated below are from our experiences with the cars and preferences, and won’t necessarily be true for you. 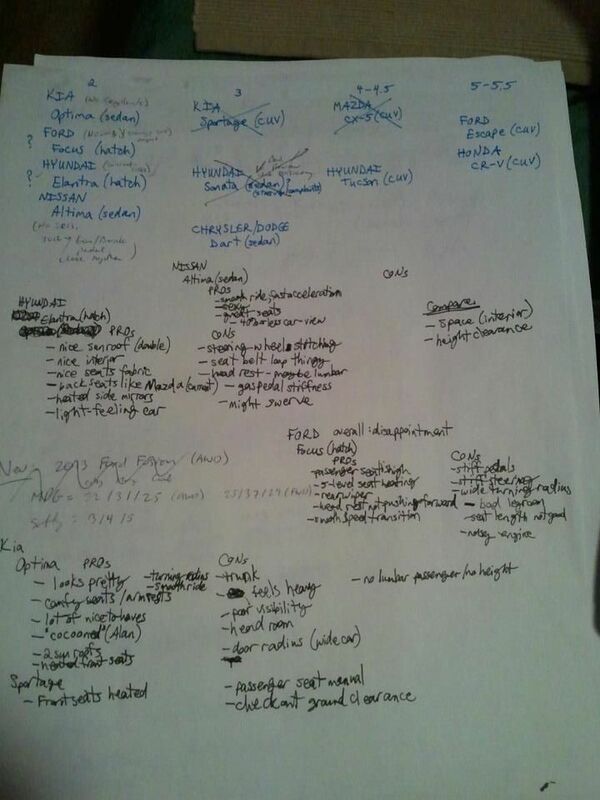 To explain the pictures below, the one that says Safety at the top is the top of Page 1, the one that continues the same format from “Honda” down is the bottom of Page 1, then the third picture is the shortened list from the ones we actually were most interested in, and our test drive notes. What we did was look at each manufacturer and list the vehicles they had in the categories we were interested in (sedan, hatch, SUV). Some we knew already were crossed off the list – Subaru for example had an unfavourable test drive (engine revving sounded whiny), and the Honda Accord – just from sitting in it. So we didn’t waste time with them in these lists. Next we listed all the safety ratings. All the 4/5/4 numbers you see are out of a potential 5/5/5 (front impact, side impact, rollover impact) rating. If it got a 3/5 for any of them, we considered it a safety risk and crossed it off the list. 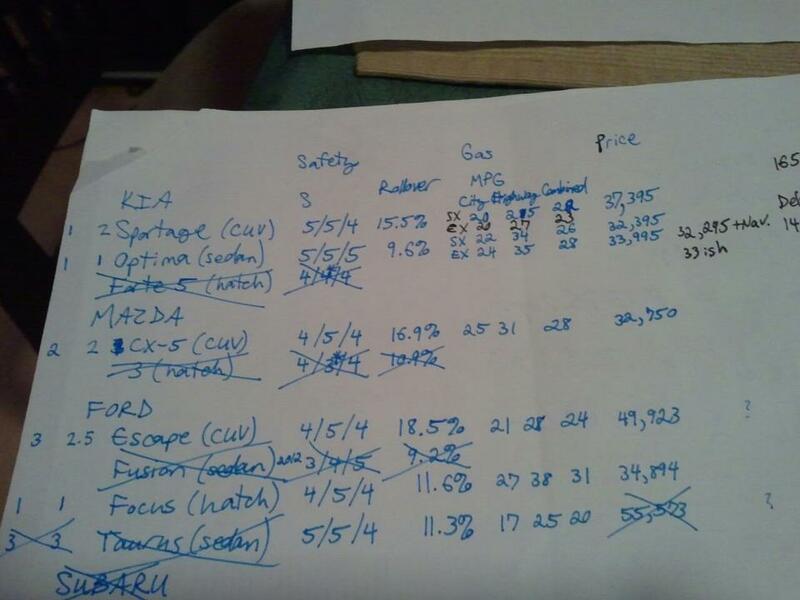 Then we compiled all the Rollover percentages and Gas mileage. The gas mileage is in three numbers: City MPG, Highway MPG, and Combined MPG (you might find if you only ever do City driving, you might not care about the Highway or Combined numbers. We do a combination of both so we looked at all of the numbers). There were a couple of vehicles that had such bad gas mileage we crossed them off the list (GM Terrain) and the Acuras only take Premium gas so we crossed them off the list as well. Oh, and the Ford Taurus was bad on gas too, so it was nixed. Next we took the price – for the trim level that my bf and I would be interested in – and keep in mind you’ll be adding a few thousand for delivery of the car and taxes, so don’t buy a car thinking the advertised price is what you’ll be paying. Some vehicles we looked at the combination of all these factors and decided, you know what? If it’s got an okay safety rating (say, 4/5/4), but high rollover percentage compared to the others, not that great gas mileage, and fairly expensive, we crossed it off the list. Nissan Rogue, GM Terrain were a couple examples of overall not being that great (on paper at least). Next I went through each remaining car and rated them on how much I wanted to take it on a test drive to see if it was any good to drive. 1 means I really want to try it out, 2 means I can take it or leave it, and 3 means I really don’t care if we cross this one off the list. My bf did the same, and those are the numbers on the far left of the page. We added them up and the cars with the lowest scores made it into the first column of the Short List page (under “2” which represents the total score of 1 from bf + 1 from me). Second column are the ones that are next in line to test drive, and so on. The ones in the last columns we didn’t really care about. The Optima didn’t have any complaints (makes sense, safest car at 5/5/5). The Focus didn’t have 2013 model data but had some steering and engine complaints from past years. The Elantra had a weird complaint(s) of the sun roof randomly breaking into tiny pieces, not sure how recent that was. The Altima didn’t have any 2013 complaints, and the only complaint from 2012 was that the gas and brake pedals were close together – something they changed in the 2013 model. Each one is separated into PROs and CONs. I ran out of space so I put the Altima at the top but then didn’t need the CONs column because we didn’t have any! A couple things I noticed in a few vehicles: passenger side seat adjustments are often manual, even when driver’s side has power adjustable seats. This annoyed me a lot because I want to be comfortable as well as my bf does! Hello, equality! (especially if you consider how many people shop for cars with their partners, who will often have just as much say in the final purchase as the main driver……. come on marketers wake up!) 😉 As a result, I started taking note of how much visibility I got as the passenger since I was often sitting low in the seat and couldn’t adjust it – so you’ll see notes like “40% or less car-view” which means: when I’m looking straight ahead of me how high does the dashboard come up into my view out the window? How much “car-view” do I have when seated normally? Seat comfort was very very important to us, because we plan on doing road trips and a lot of 1.5+ hour drives. The seats in the Nissan Altima were designed by NASA engineers to be zero-gravity and when we sat in them our jaws dropped open – it was like sitting in a couch it was so comfortable!!!! After the test-drive, my bf asked me, “So….. can we buy it?” and I immediately said, “Yes.” He’d asked what I thought about buying the KIA Sportage (the first one we test-drove – before these charts were even created – and we really liked it, but didn’t like the gas mileage) and the Hyundai Elantra previously but we weren’t ready yet to make those decisions. After test-driving the Altima though, it was obvious to us that it was an easy choice to make. Now, when you consider the price difference between the Hyundai Elantra (~25,000$), the KIA Optima (~33,000$), and the Nissan Altima (~29,000$), personally obviously we’d suggest the Altima because of a few things – we definitely liked the drive the best, it’s cheaper, has better visibility, and feels lighter to drive than the Optima. The Optima wasn’t bad, and had a great turning radius, but felt like you were driving a really safe heavy brick! Our second choice probably would have been the Elantra. We really didn’t see why the Elantra was so much less expensive than the Optima, because it was really nice to drive too. The sunroof is double and the best of them all (not that that’s necessary, but still! )……the drive was a little stiffer than the Altima (sportier feel) meaning the gas/brake pedals and steering wheel were a little harder to move. Some people like that style, we didn’t mind either way, but it was a definite difference in feel. Oh, and the Ford Focus was an absolute disappointment. It looked great on paper, got all these great reviews, and then we took it for a test-drive and it sounded like it was labouring to get up to speed on the highway. Its turning radius was horribly wide, and my bf hit his knee against the median 2 or 3 times just in driving the car – the leg room was awfully small. Overall, sounded and felt like a cheap car, yet it was as much money as the Optima! Like I said, some makes and models didn’t make it on to the page but were considered beforehand and dismissed. VW was actually one of those, because we took a brief test-drive with the Passat and didn’t really like it, it sounded like the engine was labouring. Also we didn’t think the trim of the interior was very nice, and I think they are expensive, but don’t really remember how much. And the Tiguan as you’ll see on Page 1 (bottom) had a bad safety rating and a pretty high rollover percentage for our comfort level. Overall, my advice would be to collect a handful of vehicles you’re interested in, and test drive (with your significant other if you can/have one!) as many as you can in one or two days. You want to be in the same mind-frame so you can compare them better. If you can, drive it in day and night to see any differences. I DEFINITELY recommend taking notes because trust me, it’s so easy to get confused which one had what sun roof and which had the weird steering…… if it’s not written down. I took my sheets of paper with me everywhere so I could compare on the spot to the other cars we drove. It also shows the dealers you’re serious about buying, and I’d like to think they knew they couldn’t pull anything on us because they saw we would know if they were lying! 😉 Some people recommended we rent the model we’re interested in buying, but at the time we were still interested in the Kia Sportage, but nowhere near us was renting those out, so that’s not always possible but would be a great idea if you can find the model you’re interested in. When Time is of the Essence…..
Clocks are the absolute worst waste of time. For as long as you think you are a victim, you will be. Copyright L.M. 2008. (maybe someone said it similar, but I just thought of it today, so whatever. haha.). 1. any of numerous Old World lizards of the family Chamaeleontidae, characterized by the ability to change the color of their skin, very slow locomotion, and a projectile tongue. 2. any of several American lizards capable of changing the color of the skin, esp. Anolis carolinensis (American chameleon), of the southeastern U.S.
3. a changeable, fickle, or inconstant person. 4. (initial capital letter ) Astronomy. Chamaeleon. Let me tell you why I disagree with this. I believe human chameleons are essential in this world. People who have multiple versions of themselves can play many roles in society, and fill many voids at once. To be a chameleon is to adapt constantly according to the need of the situation. What this definition is implying is that society changes them, but it’s actually quite incorrect: a chameleon changes intentionally to best suit society. To be a human chameleon can have its benefits, both individually, and in social groups. If a chameleon chooses its friends wisely, they can be everything they want to be, simply by proxy. Through the chameleon’s innate desire to change, they can actually inspire themselves through their friendships to become like the people they so admire. Becoming better is never a bad thing. A chameleon always knows its true colours, but will sacrifice peacocking its identity for the sake of the situation. (from http://dictionary.reference.com/browse/fickle ) by Princeton’s online dictionary, WordNet 3.0. “Unpredictable change“? How did chameleons suddenly become unreliable? No, you won’t see a real chameleon change its colours when perfectly blended somewhere….. or they would no longer blend, and that’s not what a chameleon is all about. Human chameleons are not unreliable; they will blend wherever they may go, but that can be relied upon. You can always count on a chameleon to reflect their surroundings. You may wonder how someone can have a sense of identity if they are constantly changing. This is a valid question, however, you need simply look at anyone else for your answer. Can a child have a sense of identity and, as an adult, have the same one? Can someone have a sense of identity, go through a life-changing moment, and it stay the same? No, people change; identities change. However, chameleons generally still have what I call default personalities, ones that they exemplify when they are in situations where they feel comfortable. These default personalities might, or might not, coincide with their neutral personalities. Neutral personalities are ones that chameleons adopt when in new situations or meeting new people. They are the versions of themselves that they have deemed least threatening — to others, or to themselves. Yes, certain personalities can expose the chameleon more than they would like, and therefore are not usually the same as the default ones. Since chameleons are able to change their moods in situations, they can often be unsure of themselves, as they can have easily avoided addressing the issue of beliefs. Beliefs are as constant in chameleons as they are with non-chameleons; they do not change in different situations; they do not meld any more or less than anyone else’s when faced with new ideas. As chameleons can often evade difficult confrontations and intimate questioning via distraction through other personalities, some may not be sure as to the real answers of those questions, and when trying to discover themselves, may feel lost. “Others have already figured out their beliefs,” they may think, “why haven’t I been able to pinpoint mine?” The solution to this is simply (and very not-so-simply) to ask themselves these very questions, to investigate how they would react in certain ethical situations if no one were around to judge or blend with. This is a difficult process (and one that tests a chameleon’s ability to moderate their own subjectivity), as a chameleon is used to looking to others for guidance in how to act. However, even a chameleon will refuse to blend in a situation where they feel something is wrong. This is due to the beliefs that they have determined. Regardless the situation, if a chameleon has a belief that is being disregarded, they will not feel comfortable blending. This is why I feel the definition of being “fickle” is quite incorrect; chameleons do not usually demean their integrity by associating (via blending) with people or situations that are contrary to their personal spirit. I hope this has been somewhat informative for people who may feel like they are chameleons at heart, but maybe had previously thought it was shameful. Chameleons play a vital ‘role of roles’ in society, and should be appreciated for the adaptable creatures they are.